bouquets for mom, originally uploaded by jahansell. Not my kids - they belong to friends who live in Lakeville. But it's such a timeless image, isn't it? What a lovely picture this is; it would make a great Greetings Card. Are they really picking Dandelions? We were told as children that if we picked them we would wet the bed (I think that's because they diuretic properties if eaten). 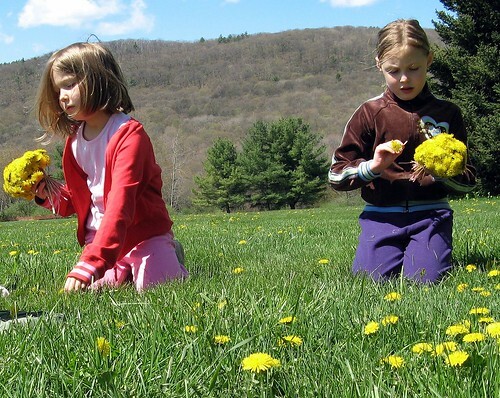 I remember picking dandelions and thinking they were beautiful. They are beautiful in this photo. oh, this is an instant fave! Boy this brings back lots of memories. I think all parents have experienced small blessings like this one. I got to fly last night. I mean I just dove in and flew. You can find out how on my blog post today. yes-this is a timeless and very sweet shot! A very good expressive shot, about childooh innocences.